The ZTE Grand Memo has been officially unveiled at MWC 2013 in Barcelona, with the super sized phone ready to take on the "phablet" market. With a 5.7-inch display the Grand Memo is set to go head to head with the Samsung Galaxy Note 2 and Huawei Ascend Mate. The display sports a full HD resolution and the Grand Memo also packs a 1.5GHz quad-core processor, 13MP camera, Android Jelly Bean and a 3,200mAh battery into a frame which is just 8.5mm thick. 4G connectivity is included in the ZTE Grand Memo along with Wi-Fi 5.0GHz, providing you access to some speedy web connections. Dolby Digital is incorporated into the handset, to deliver the sound quality which apparently does justice to the large, full HD display found on this handset. 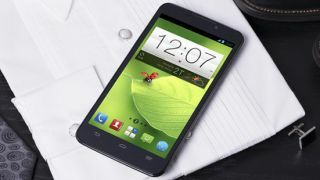 The ZTE Grand Memo will be available later this year, but exact release date along with a price is currently unknown.